First and foremost, let us say thank you for your service to our great country and your fellow man. It is truly our honor to serve those who proudly serve. We hope the enclosed information will help to answer your questions about some of the burial and cremation options available to you at our funeral home. In addition to providing funeral and cremation care, we also help families apply for all Veteran's and Social Security benefits available, arrange for military honors, and assist with obtaining life insurance benefits. Our licensed funeral directors and staff stand ready to assist if you have additional questions. Please contact us at (651)464-3556. At Mattson Funeral Home, we are dedicated to providing excellent and compassionate care For Those Who Serve. We believe you deserve the very best. For your convenience and cost savings, we offer several burial and cremation options for you to choose from. All of our burial & cremation options are also available to the spouse of eligible veterans. Transportation to cemetery within a 30-mile radius, which includes Ft. Snelling National Cemetery, Minneapolis, MN. The most caring thing you can do for your family is to plan your wishes in advance. Locating important documents that initiate the entire benefit process is often a difficult issue for surviving family members. To establish eligibility for burial in a VA national cemetery, the family must provide: the Veteran's discharge document; report of casualty; or the Veteran's full name; military rank; branch of service; dates of entry and discharge; serial, Social Security, and/or VA claim numbers; date and place of birth; and date of death. It is important for your family to know where this information is safely kept. Our funeral home will also be glad to keep copies of these records in your pre-arrangement file. Ask about our 10% merchandise discount for veterans and spouses. Burial in a national cemetery is open to all members of the armed forces and Veterans who have met minimum active duty service requirements and were discharged under conditionsother than dishonorable. Their spouse, widow or widower, minor children, and, under certain conditions, unmarried adult children with disabilities, may also be eligible for burial. Eligible spouses and children may be buried even if they predecease the Veteran. Members of the reserve components of the armed forces who die while on active duty or while performing training duty, or were eligible for retired pay, may also be eligible for burial. Note: A grave liner does not seal like a burial vault. If you choose to purchase a burial vault, you may be entitled to a cost allowance. Veteran benefits do not include an allowance for urn vaults. Perpetual care as part of a national shrine. Military Honors may include a rifle salute, playing of Taps, and the presentation of the US Flag. There are circumstances that may prevent eligibility. Children 18 years of age or older arenot eligible to be buried at a National Cemetery unless they continue to be dependent due to mental or physical reasons. 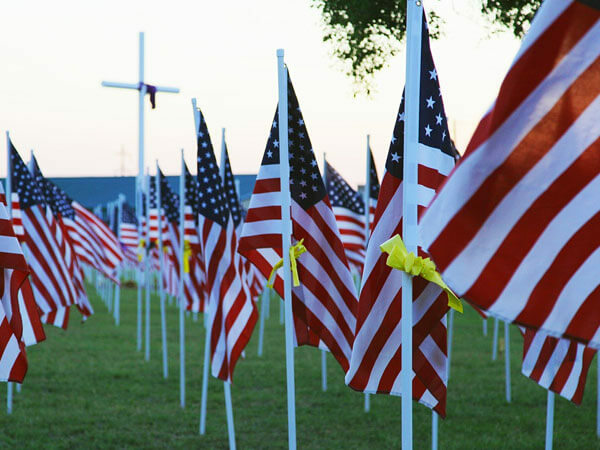 The spouse or children of a veteran may specify and/or notify a National Cemetery they do not wish to be buried there. In the case of divorce, the former spouse of the veteran gives up the right to be buried with the veteran.